The last thing that I needed to do to finish the project was to add doors to the gates. I had already made a gate for the main gateway using Hexagon parts, so that was done. 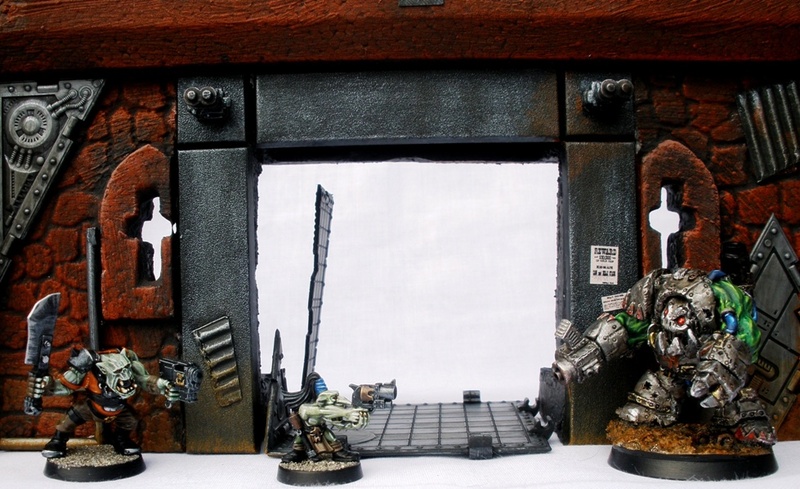 The first game that I am likely to be playing with the fort is Gorkamorka, which is the primary reason why I dug out the fort a while back. 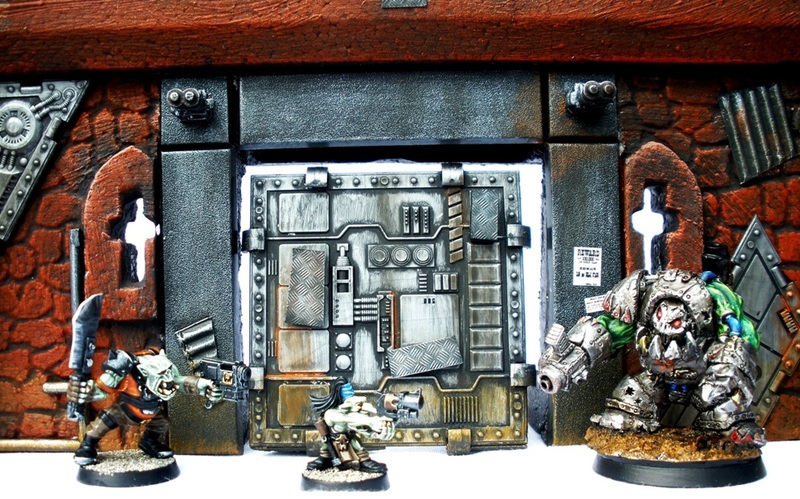 Gorkamorka is an old (1997) Games Workshop game set in a post apocalyptic wasteland populated primarily by orks driving around in ramshackle buggies, fighting and collecting valuable pieces of scrap (as I wrote about a while back). Each faction in that game has their own fort and some of the scenarios are based on raids on the fort, either to steal scrap from the owners or to rescue captured team mates or whatever. In Gorkamorka the fort has simple rules for play. All weapons in the game are deemed to be ineffectual against the fort walls themselves with the gate being the only weak point. 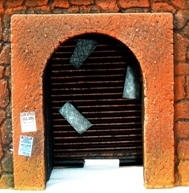 As such the gate can exist in the game in one of five different states. I wanted these states to be easily visually represented in the game. Hexagon to the rescue. I assembled some Hexagon parts via its own clip together system in such a way that I can stand it up a number of ways. 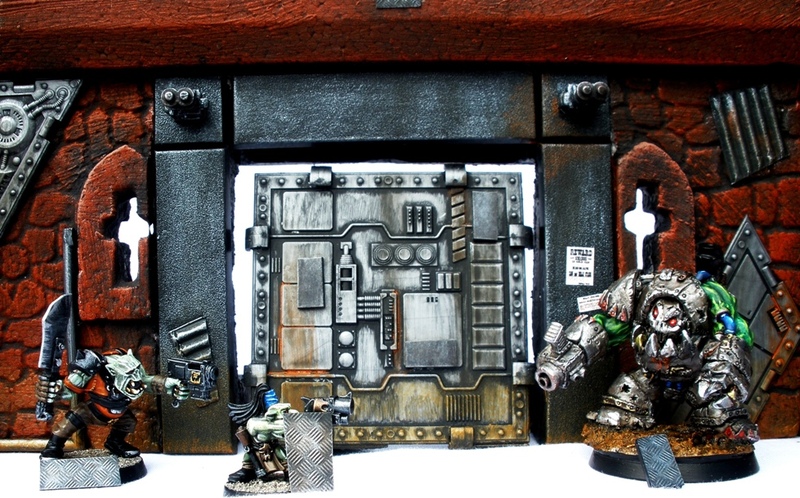 I painted it along with the other metal areas on the model as shown below. Gate state 1 is undamaged. See the picture at the top of the post for an idea of how that looks. Gate state 2 is still closed, but more likely to become damaged with further hits. For that I have added three bits of plasticard attached via magnets to record the damage accumulated. As the gate is damaged these are removed and placed in front of the gate as a reminder as to how damaged it has become. 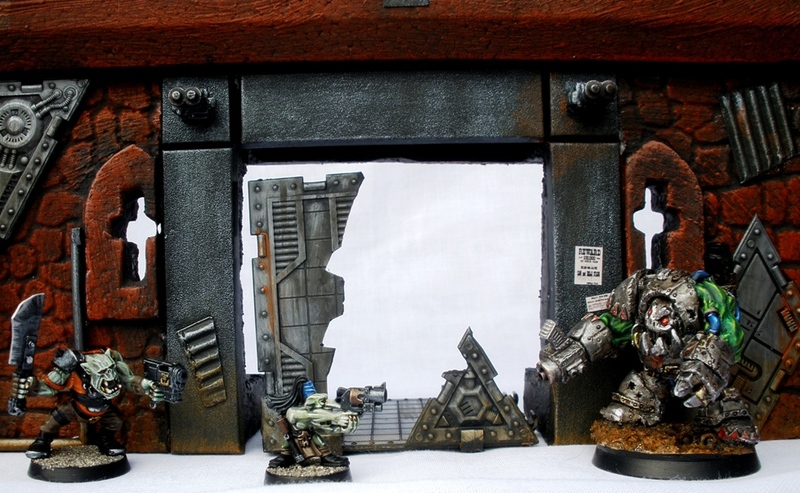 You can see the pieces propped up against Krusher and the ork and gretchin in the shot above. You can also see the rectangular magnetic areas on the door. Gate state 3 is damaged enough to allow footsloggers through, but not vehicles: half open in other words. The gate model can be rotated to show another side for this state. Gate state 4 is destroyed, but with enough wreckage still in the area to impede some movement. 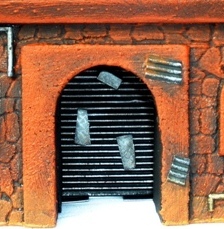 The gate model can be turned to one side to crudely but conveniently represent this, as shown below. Gate state 5 is completely destroyed, for which I will simply remove the model entirely. Obviously I didn’t take a photo of “no gate”. There are three more smaller gates in the fort. 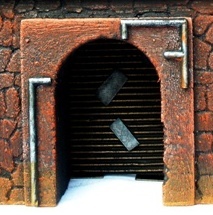 I suspect that the majority of the games that feature the fort will feature only one gate, for which I will use the gate shown above. For the rare occasions that the other gates are required I quickly made the following very simple pieces. Nothing fancy really. Although my patience has grown thin I did find the time to add the magnetic damage markers. Penultimately I roughly overbrushed/drybrushed paint that matches my gaming surface onto the bottom of all 32 pieces of the fort, so that it looks a little less “perched” on the terrain. I then added some “Wanted” posters that I got from the Foundry website and printed out. While posters written in English dont exactly fit the Gorkamorka setting, they do fit the ideas that I have in mind for my post apocalyptic western town, Standard Falls. As this terrain is intended to fit in with that too, I figured that those posters would be apt. I intend to add some more posters at a later date (likely some of these, thanks TAL! ), but havent got around to printing them out yet. That meant that I was finally finished. It was a pretty big undertaking by my standards these days and I wont be able to look objectively at the whole thing for a while yet. I do think that it looks respectable as terrain goes. Its not convention quality stuff but it is practical and I am reasonably satisfied with it. I am looking forward to enjoying a few miniature post-apocalyptic sieges in and around it this summer. This post is already too big so I will put the finished photos up next time. Nothing is like the satisfaction of bringing a project like yours to the finish line. For me it’s often a problem of growing tired of painting similar objects again and again. But you did it, with some nice touches to make the pieces look different enough from each other too. It looks great! Thanks apeekaboo. I regret the basic colour chosne a bit, but like I said, I cant see it objectively yet. Painting the same thing over and over is a pain in the arse. Sixteen walls plus sixteen towers plus four gates was a lot of repetition for something that I do “for fun” alright. I am definitely looking forward to a few games in and around the terrain pieces though. Congratulations Paul! I never seem to be able to finish a large terrain project, so what you’ve done is remarkable indeed. Looking forward to seeing the pictures of the whole thing. I think the reason that this particular project even got finished is because I have so many others unfinished, which in turn have taught me a few things. Mainly what I learned from those aborted projects was to keep things simple so that it gets finished before boredom sets in. While there are beautiful examples of gaming table works of art all over the internet, I dont have the facilities, storage or patience to emulate them. I have a good idea of what I can feasibly achieve before I lose interest and what constitutes a decent, practical gaming piece. Those are the principles that I come back to any time that I consider adding something to pieces like this (for example I considered adding awnings and tarpaulins to parts of the fort. While they may have looked nice they would have been a lot of hassle to store and ended up damaged in a short time anyway, so I left them out). It’s a fine art, striking a good balance between looks, storability and ease of construction. The jungle terrain I’ve constructed (I keep referring to that, since it’s pretty much what I’ve done scenery-wise lately) looks pretty nice, is easy to build and an absolute pain to store. Someday I’ll learn. I actually have a lot of terrain projects in the pipeline, with materials already acquired for them all (so cash flow problems wont stop them at least). Next terrain project is a post-apoc shanty town that should fit in with the foam rocks and the fort quite well. I have already bought everything that I need to get working on it but I wont get to it for another month at least. In addition to real life considerations I also have to keep working on my GoMo orks (24 figures and counting) while I still have the enthusiasm for them. They are working out well and are great fun to paint, so I suspect that they will get fully finished, with about ~50 finished by the end of the project. Still waiting for a big picture, Paul. Some bigger photos will be up on Wednesday, plus sixteen individual shots each of a wall plus a tower. I ran out of time taking photos yesterday before I got a shot of the entire 36 piece fort, but the shots I have should show every element of the finished product in all of its cheesy, post apocalyptic, science-fantasy glory. I just regret that I forgot to include a dinosaur in one of the shots. Cant have everything I suppose. Looking forward to seeing the whole project in all its glory.